WARSAW, Ind. (CBS/WANE) Twelve-year-old Indiana boy Paul Gingerich has been sentenced to 25 years in prison for his role in the killing of the stepfather of one of his friends. A judge Tuesday sentenced Gingerich to 30 years total for the crime, with the last five to be served on probation. On April 20 of last year, Colt Lundy and Gingerich shot 49-year-old Phillip Danner in his home in Cromwell. Danner was shot four times and died in the home. Danner is Lundy's stepfather. CBS affiliate WANE reports that during the sentencing hearing Gingerich said, "I'm sorry for what happened to Mr. Danner. I'm sorry for what the family has to go through. I did wrong and I'm ready [to take] responsibility for my action." It was also recommended that Gingerich take part in the Youth Incarcerated as an Adult program. In September of 2010, a Kosciusko Circuit Court judge accepted Colt Lundy's plea deal and sentenced him to 30 years with the last five years of the sentence suspended, according to WANE. Lundy, 15, will serve that time on probation. The judge added that he's recommending to the Indiana Department of Corrections that Lundy be in the youth offender program in the Wabash Valley Correctional Facility until age 18. Lundy will also get credit for the 152 days he's already been in the Kosciusko County Jail. Lundy pleaded guilty to conspiracy to commit murder in exchange for dropping the murder and aiding in murder charges. Police said Danner was shot multiple times: once in the eye, once in the wrist and twice in the chest. Police testimony said the 15-year-old Lundy, Paul Gingerich and another 12-year-old had planned for weeks to kill Danner and then go to Arizona to sell T-shirts to "drug people." Lundy and Gingerich each fired two shots at Danner. Kosciusko County Detective Jonathan Tyler has testified Lundy talked about his plan to kill Danner with several boys on a playground in their neighborhood on April 20. Lundy then went back to his home and got Danner's revolver and semi-automatic handgun. After Lundy gave a signal, Gingerich, and another 12-year-old boy came into the Lundy house. Tyler said Gingerich went into the home through Lundy's bedroom window and Lundy gave Gingerich the handgun. Tyler continued, saying Lundy and Gingerich then went into the living room and sat on the couch and a chair waiting for Danner to come to the doorway between the kitchen and living room. When Danner did, Tyler said both boys fired two shots. After they fired the guns, Tyler said Lundy and Gingerich went to the front door where the other boy was outside to show him what had happened. Lundy then packed clothes, food, ammunition and fire arms and later that night the three boys left in Danner's car to go to Arizona. The police investigation stated that there is no evidence of abuse between Danner and Lundy. 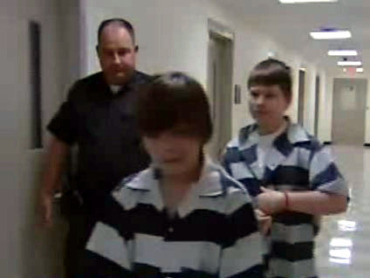 April 30, 2010 - Did Indiana Boys, 12 and 15, Kill Stepdad so They Could Run Away?